Torch Relay lands in Hawaii! 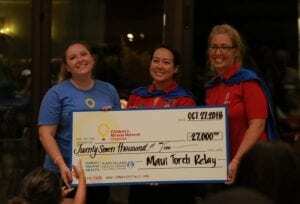 Mahalo to our Marriott Residence Inn on Maui for hosting the annual Torch Relay for Children’s Miracle Network. The team at Marriott brought friends, families and local supporters together for an afternoon of fun. The total of $27,000 raised will benefit Kapi’olani Medical Center and kids like 2018 Champion, Kayle Osai and Maui resident, Jaedon, who were both there to cheer on the participants.